Hamariweb.com is becoming the most favorite web portal of all age groups in Pakistan and Overseas Pakistani's including professionals, business decision makers and students. After the launching of Hamariweb.com in August 2007, millions of people visited and used various services offered by Hamariweb.com - absolutely free! Want to know more click here to read what news and media say about Hamariweb.com. Finding quality websites over the internet is becoming a harder job now, especially finding a website that would be relevant to our culture, society, and lifestyle as well as contain info in daily spoken language, Urdu including English – a hardest job. Hamariweb.com is just a dedicated effort to fulfill this need for all segments of our population. People can find all of the essential tools and information of their daily needs and interests in an Anglo-Urdu style website. 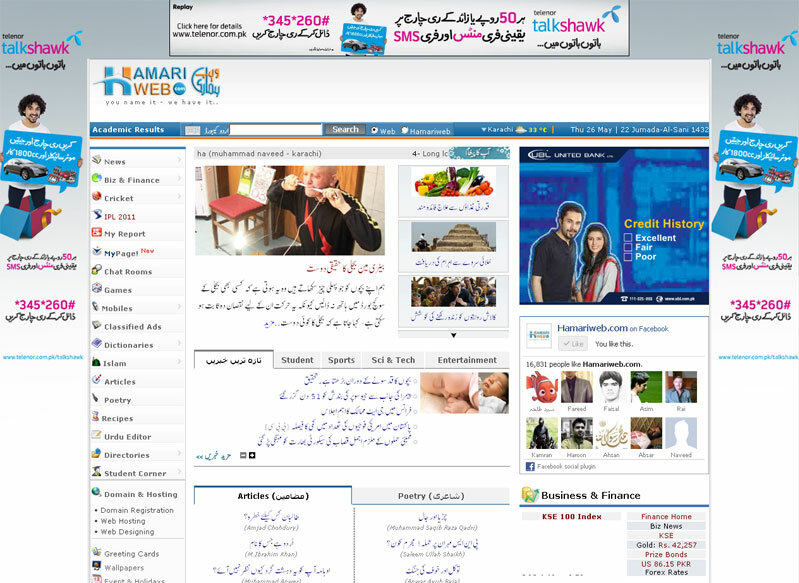 Hamariweb.com is giving the opportunity to advertise your brand to a vast majority across Pakistan. Your advertising message will also reach to a Pakistani & Urdu reading community all over the world. The idea generated behind the initiation on this strategy is to maximize view age and client interest. Our Web Page serves as a central “hub” were customers log in or search for their various needs and requirements. To advertise with us will allow you to gain a positive market approach and thereby help in gaining a market share and percentage. Hamariweb.com offers highly result-driven advertising programs to satisfy any consumer needs. We offer 3 different kinds of Advertisements to our clients. With the application of any or all of the following types you shall be able to cater to your target market and gain a larger reach for clients that are present. Hamariweb.com offers CPM based Advertisment to gives you the flexibility to create a high-impact advertising campaign with standard and rich media formats. This flexibility can be ascertained by combining a variety of advertising units, to help you build a strong advertising campaign that reaches your target markets and objectives with a powerful advertising platform on the web. Background advertising (also known as “skinning”) has been a popular form of advertising. The idea of such campaigns is to break through the noise on the given site, so the ads can’t be missed. Visually,they aren’t always pretty, but many swear by them as an effective way to reach an audience. Now Hamariweb.com is also offering Background advertising. Sponsorship is an effective and creative means of reaching your target audience and keeping your brand front-of-mind. Currently we are offering sponsorships for Dream Team & Cricket Section for the advertisers targeting the cricket lovers, Finance & News section for the advertisers targeting professionals & business community & Recipes Section. Please contact us to discuss more about sponsorship opportunities.